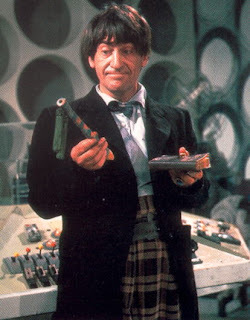 So quoth the Second Doctor on a visit to UNIT headquarters. Well, I've had the decorators in this week and given the site a spruce up. After all, Cathode Ray Tube has been diligently working away now for over three years and it was time for a change. Now that things are back on a more or less even footing, you can look forward to reviews of the Doctor Who Christmas Special and more BFI Flipside DVD releases in January. Plus I'm threatening to do a 'best of 2010' thing to include all the books, DVDs and music I just didn't get a chance to do full reviews of in the last six months. I hope you'll stick around. Compliments on the new look, and more generally on the season! Thanks Matthew! And the very best wishes for the Christmas and New Year to you.